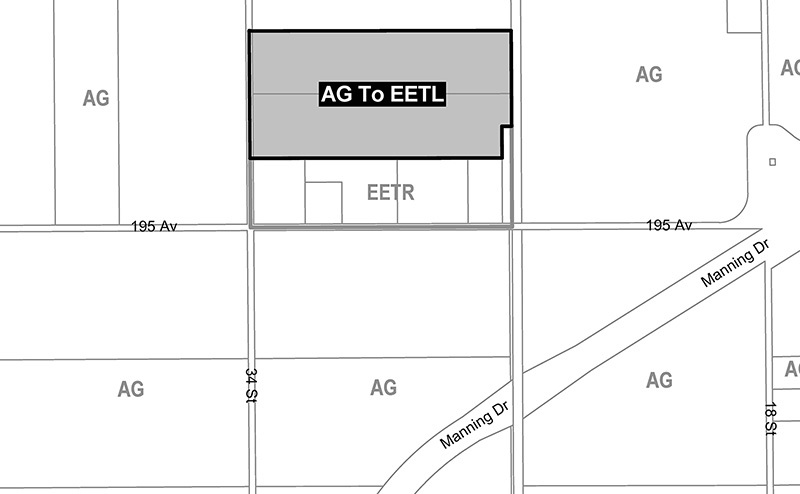 Rezoning in the Edmonton Energy and Technology Park at 19807 34 Street NW and 20033 34 Street NW. Map of the proposed rezoning area. View larger image. The application proposes to rezone two separate parcels of land from Agricultural Zone (AG) to Edmonton Energy and Technology Park Logistics Zone (EETL). The applicant intends to develop a General Industrial Use (asphalt plant). The application conforms with the Edmonton Energy and Technology Park Area Structure Plan, which designates the lands within the Logistics Precinct. A project within the Edmonton Energy and Technology Park requires a considerable amount of technical review and associated engineering studies. Preliminary studies have been provided by the applicant to support this rezoning. Hydro-Geotechnical Desktop Assessment To identify potential hydrogeological and geotechnical issues that may affect the design and development of the lands SolidEarth Geotechnical Inc. Phase II Ecological Network Report Assesses the ecological features of the subject site Maddison Consultants Ltd. Phase I & II Environmental Site Assessment To determine whether there have been soil and/or groundwater impacts on the property from potential contaminants or concerns associated with present or historical property uses Ballast Environmental Consulting Ltd.
Site Level Servicing Report Assesses existing site features, explores the existing geotechnical and environmental conditions and recommends sanitary and storm water management solutions WSP Canada Inc.
Technical Report A summary of the above reports to help inform and support the proposed rezoning WSP Canada Inc.